Old Coin Necklace, Silver and Copper Necklace, Dime Necklace, Penny Necklace, Castanet Necklace, Sterling silver necklace with dime. Custom Coin Necklace. The Mercury Dime was minted from 1916-1945 in America. The Wheat Penny was minted from 1909-1942. 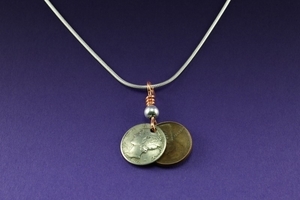 This coin jewelry castanet form necklace is very versatile and can be worn on either side. Also available on leather cord tied in an adjustable slip knot for $50. Can be made from your coins for $20. This handcrafted coin jewelry necklace is made in the USA.